While we await the longed-for debut of the new line of Kaiotos sports boats - 64 to 95 feet long fast commuter boats characterised by their high performance, with maximum speeds of over 50 knots guaranteed by Arneson transmission and surface propellers - the Cantieri di Pisa have presented their new opening model for the Akhir range, the 85. This is an evolution of the well-known and appreciated Akhir 25S, a motoryacht featuring a more modern layout and with new living solutions that make it even more comfortable. Development of the interiors now means that the four guest cabins are located on the lower deck towards the bow after the engine room. Whereas the owner's full beam cabin is situated amidships astern of the latter, separated from the engine room by service rooms, a bathroom and dressing room, for better soundproofing. The two guest cabins with twin beds and a third hideaway bed are in the middle of the boat while in the bow there is a spacious VIP cabin. The main saloon with its dining area occupies half the space on the main deck, leaving the rest for the galley, the guest bathroom and the wheelhouse, equipped with the most advanced boating and communication systems. 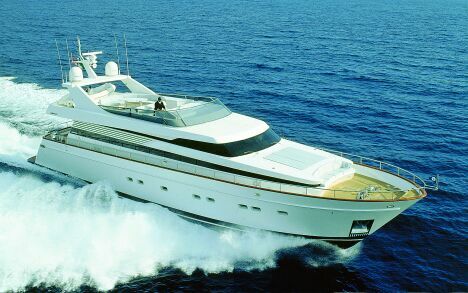 All the interiors are in teak, satin finish on the main deck and sand blasted in the cabins, which feature the extremely high quality finishing details that have made the Cantieri di Pisa famous throughout the world. If the Akhir 85 is the smallest motoryacht in the Akhir range, we would like to remind you that the biggest is the Akhir 140, followed by a 125, a 115 and a 100 footer. At the moment the boatyard, with premises in Pisa, is working hard with various 85's under construction, a 100, two 125's and a new 140.